Navitel.Cloud service allows you to save your settings, waypoints, and search history in the cloud data storage. The data saved in the cloud can be restored afterwards in case you have reinstalled the program. 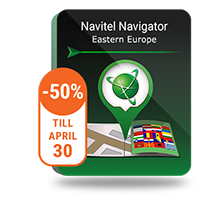 If you use Navitel Navigator on several devices, waypoints and history data can be synchronized between all of them, which might come handy, saving you time otherwise spent transferring the necessary files. The Internet connection is required. On the map screen, within the toolbar, tap the icon. If you do not see this icon, try rotating the screen in order to change the screen orientation. If it does not help and the icon does not appear, select Menu > Settings > Interface > Map buttons, and then enable the Navitel.Cloud icon display. In the newly opened dialog box, select Turn on. Enter your login and password data (same as on Navitel website or Navitel.Friends service). Alternatively, you can log in with either VK, FB, or Google. Your Navitel account has to be synched with them. 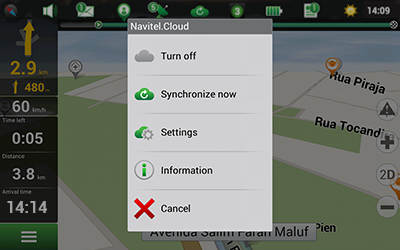 In the Navitel.Cloud dialog box, select Settings, and then select data which you want to synchronize. 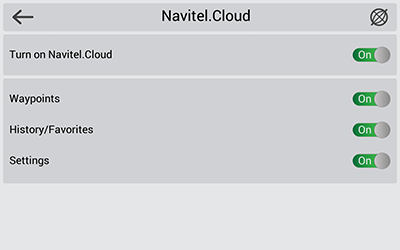 Go back to the Navitel.Cloud dialog box, and tap the Synchronize now option. Repeat these steps on another device, which you want to synchronize with.